At Little Voices we pride ourselves on working with Principals and Tutors that can inspire pupils to be the best that they can be. If your child comes to Little Voices and feels safe and happy they will succeed, and they will succeed by being inspired. Education is not about feeding children with information and skills. The word ‘education’ derives from the Latin verb educare meaning to draw out. 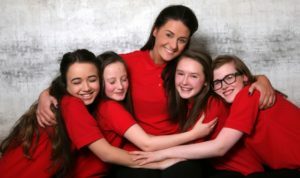 Music and Drama education at Little Voices it is about creating a stimulating environment, to inspire a child to access what they are already capable of. We strive to help every child to find the confidence to shine. One of our core beliefs is “inspiring everyone to be the best that they can be”. Our Principals want to ensure your child goes in the right small group for them. They will also be honest with parents and tell you if we are not the organisation for your child. We don’t do big shows, it’s not all about the performance. It is about skills; it is about learning the tools to be able to put them to practise in all areas of life; on the stage, at a family party, in an interview or under pressure in a presentation situation at school/work. Once your child comes to our centres they will be warmly welcomed into a small group of similar age/ability children. They may feel a little apprehensive but how they leave the teaching room will be different to when they first arrived. They will feel safe, they will have fun and they will experience an inspiring lesson with our tutors. The Principals sometimes teach themselves but often there are tutors who have been trained the Little Voices way and believe in Little Voices delivering the drama lessons or the singing lesson. Our tutors want the very best for your child; they want to get to know them, to make them feel included in the group dynamic as soon as possible and because our groups are so small our tutors know every child individually by name and what they are capable of. Our tutors are very passionate, highly motivated and genuinely care. They have a love and experience of the performing arts, they have high expectations and help your child to be the best that they can be. Often tutors have performed themselves and this helps to inspire children, give them ideas and suggestions on how to access characters, their voice and reach their full potential. Children start as young as Reception age with Little Voices and grow and develop through to 18 years old. They then become Assistant tutors and tutors and even Principals years later, in fact many pupils taught for us, been trained our way and then gone on to be Principals running their own centres too. This organic growth of Little Voices is so special. Inspiration is happening in the teaching rooms, but it surrounds the entire organisation. We continue to develop and grow because of people talking to other people, mentioning Little Voices to their school and their connections, their friends and family. Thank you for this and please continue to do so we are very lucky and proud that Little Voices evolves in this way in towns and villages across the UK. Everyone has something special to share and we intend to inspire everyone to be the best that they can be for decades to come. Would you like to turn your passion for the arts into your dream job? By completing this field you are consenting to Little Voices contacting you by email to discuss franchise opportunities. By completing this field you are consenting to Little Voices contacting you by telephone to discuss franchise opportunities. Is there any other information you wish to tell us? Or any questions you would like specifically answering? When a parent hears about Little Voices they feel compelled to pick up the phone, Facebook message or submit a form on the website. They like what they read or have heard about Little Voices and they think it will be good for their child to trial a lesson. They feel that their child needs help with their confidence, or a place to make new friends and develop a new interest, they may see a talent in their child that they wish to nurture, they may have experience another organisation and need a change, they may want to challenge their child further and add to their CV L.A.M.D.A. examinations. There are whole host of reasons WHY a parent enquires with Little Voices. Our Principals want to get to know you and your child. Who your child is, what they enjoy, what experiences they have had before with all after school activities. Our Principals are keen to help but they are also keen to be realistic and honest. They want to inspire your child to be the best that they can be they want the same as you as a parent. 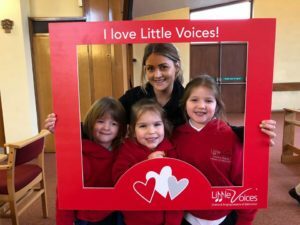 Many of our Principals are parents or they have been working with Little Voices for many years and have experience of the needs of many children and how Little Voices nurtures children. Once your child comes to our centres they will be warmly welcomed into a small group of similar age/ability children. They may feel a little apprehensive but how they leave the teaching room will be different to when they first arrived. They will feel safe, they will have fun and they will experience an inspiring lesson with our tutors. The Principals sometimes teach themselves but often there are tutors who have been trained the Little Voices way and believe in Little Voices delivering the drama lessons or the singing lesson. Our tutors want the very best for your child; they want to get to know them, to make them feel included in the group dynamic as soon as possible and because our groups are so small our tutors know every child individually by name and what they are capable of. Our tutors are very passionate, highly motivated and genuinely care. They have a love and experience of the performing arts, they have high expectations and help your child to be the best that they can be. Often tutors have performed themselves as well has having teaching experience ad this helps to inspire children, give them ideas and suggestions on how to access characters, their voice and reach their full potential. And we’ll find out more about you too!